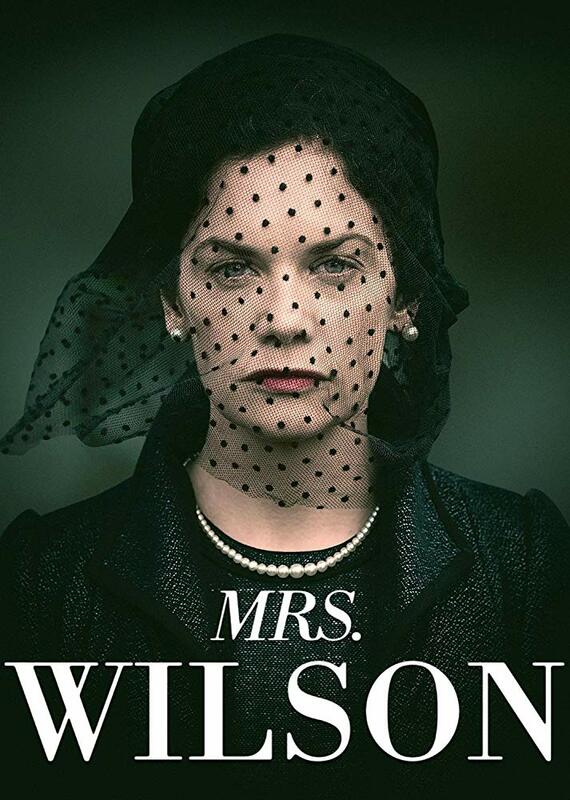 Mark your calendars for March 31 and April 7, you won't want to miss MRS WILSON on PBS Masterpiece (check your local listings for exact times; likely 9pm). You've heard the expression that truth is stranger than fiction, and this story is the proof. 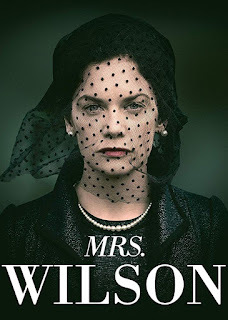 In Mrs Wilson, actress Ruth Wilson (The Affair, Jane Eyre) plays her real-life grandmother Alison Wilson in this true account of the older woman's relationship with her husband, both before and after his death. Alison met Alexander Wilson (played by Iain Glen) when they were both employed by MI6 during World War II. The two fell in love, despite their age difference (he was much older), and Alec divorced his wife to marry Alison. They had 20 years of stable marriage, raising two sons in London. While continuing to work for the Secret Intelligence Service, Alec wrote a number of well-received spy novels during his down time. He appeared to be a good family man, even when some of his undercover work took him away from home or forced him to pretend to be arrested for various petty crimes. After he died suddenly in the early 1960s, Alison quickly realized that Alec had deep secrets, and not all of them were related to his espionage work. Alison tried her best to protect her sons from learning that they'd been deceived by Alec, waiting until the new millennium before revealing part of her story and saving the rest for after her own death. Ruth Wilson, the actress, knew her grandmother, and grew up having no idea that her late-grandfather led a double (triple? quadruple?) life. Once Alison released her memoir to her sons (saving the most difficult details until after her death), her sons and grandchildren discovered that Alec had multiple wives and fathered at least seven sons. His ongoing relationship with MI6 and British Intelligence is still unclear, and many facts about the man remain unknown. The British secret service will not release Alec's records, claiming that they still contain sensitive material. The story is fascinating in of its self, but Mrs Wilson stands out in the way it follows Alison's reactions as she discovers her husband's true nature. Her emotional journey and ultimate choices are believably portrayed by the fabulous Ruth Wilson. One can only imagine the horror, shock, and devastation of learning your whole life had been a lie, and Wilson (the actress) helps us feel it all. The production focuses solidly on Alison, and Ruth Wilson, easily carries off the entire show. The supporting actors (including Keeley Hawes, Patrick Kennedy, Fiona Shaw, Anaupam Kher) who play Alison's sons and her husband's colleagues are also fantastic, projecting authentic emotions to match their different situations and relationship to Alec. The costumes and set details are excellent, clearly distinguishing between the show's present (the 1960s) and past (World War II). The music, the cars, and even the lighting matched the different moods. Just when you think Alison has Alexander Wilson all figured out, she is presented with something new. I don't know where she found her strength. 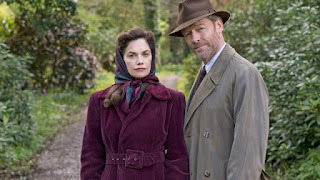 Ruth Wilson and Iain Glen shine in Mrs Wilson (Masterpiece; March 31 and April 7), and after it's over, you'll be racing to the internet to find out more. Don't miss this incredible mini-series. Here are two trailers to pull you in. Many thanks to WGBH Boston for the advanced review screener of Mrs Wilson. Mrs. Wilson is a Snowed-In Productions production for the BBC co-produced with MASTERPIECE in association with All3Media International. It is written by Anna Symon (Indian Summers), produced by Jackie Larkin (C.B. 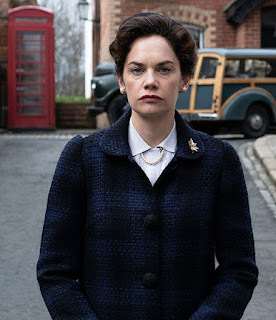 Strike), directed by Richard Laxton (Mum, River) and executive produced by Lucy Richer for the BBC, Rebecca Eaton for MASTERPIECE, Ruth Kenley-Letts (The Casual Vacancy, The Strike Series), Neil Blair (The Strike Series, Fantastic Beasts and Where To Find Them), and Ruth Wilson. I’m programming my DVR right now. Sounds made up, even though it is true! Definitely sounds worth watching! This looks awesome! I love Ruth Wilson, and I think it's fascinating that this is her own family's history. Wow, this looks awesome. Have you read the memoir? How interesting that Wilson is playing her own grandmother. I definitely want to watch this! I recently watched Abducted In Plain Sight and it was unreal too. I couldn't believe the stuff those people did. I was shaking my head all the way through. I saw this on the TV listing but didn't quite know what it was. It sounds fascinating! I'm going to set it to record now before I forget! Love Ruth Wilson for some weird reason, probably because of The Affair where I loved to hate her.